If you’re reading anything on Coffee With Kenobi, or you’re a regular listener to the podcast, it’s probably a safe bet you’re a Star Wars geek. I’d also venture to guess that the galaxy far, far away isn’t the only thing you geek out over. Take myself, for example. Yes, I love Star Wars without question — but I also want to time travel with the Doctor, attend Hogwarts, go on an adventure with a Hobbit, fight the future with Mulder and Scully, and save the world with Captain America. Most geeks I know are well-rounded people, with varying interests and fandoms, and they each have a story to tell. This is where the book Luke Skywalker Can’t Read and Other Geeky Truths comes in. Luke Skywalker Can’t Read is a compilation of essays by Ryan Britt that range from Star Wars and Star Trek, to Doctor Who and Dracula, with a whole lot of geekiness in between. Told in a conversational manner, it’s an entertaining — and personal — look at what it means to be a geek. The benefit of reading a book of essays is you can choose which topic you’d like to explore at any given time. I read the book straight through, then I went back and re-read certain sections in order to examine them a bit more deeply. You could easily skip around, however, and not lose anything in your enjoyment of the book. The essays aren’t presented as factual, of course — they’re the author’s opinions and, as such, are subjective. That’s the heart of the conversational tone of the book. When you’re in discussion with a friend about Star Wars, or Doctor Who, or what-have-you, odds are you will have differing views on certain aspects of said property. It’s not that either of you are incorrect, you just have your own interpretations. That’s the gist here. I don’t necessarily agree with everything presented, and that’s fine. The opinions offered are done so in an informed and reasoned manner, and they are always done in good humor. One of the aspects I enjoyed most were the footnotes. Some of the best anecdotes can be found there, so, if it’s your nature to skip over those — don’t! They only serve to enrich the reading experience. The essays I enjoyed most were, of course, those focussing on Star Wars and Doctor Who (and Dracula, because I love vampires), but I also appreciated the lengthy essay on the Back to the Future trilogy. I have very casually enjoyed those films in the past, but it’s been ages since I watched them and I never truly considered myself a fan (I know!). Now I’d like to watch them again, with ‘fresh’ eyes. That’s what a good essay should do, right? Move you to explore something anew? Mission accomplished. If you’re looking for an entertaining take on the geeky topics you enjoy the most, but with a personal spin, you’ll appreciate this book. Moreover, if you happen to know someone who is not into all this geek stuff (Yes, they do walk among us! ), this could serve as an introduction into our world. 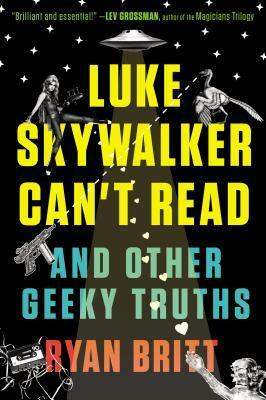 You can purchase your copy of Luke Skywalker Can’t Read and Other Geeky Truths here. You can read my interview with author Ryan Britt right here. Thank you to Penguin Random House for proving a copy of this book for review purposes. Next article Star Wars Rebels: Previews and All-New Images for "Stealth Strike"
Previous article #GIVEactually with the 501st Legion and Starlight Children's Foundation!